DAVAO CITY- Lawmakers led by Rep. Guillermo Romarate , chair of the congressional Committee on Human Rights, spearheaded an inquiry this August 13-14 into the human rights violations by the AFP in Southern Mindanao. Cases of Roque Antivo, Aida Seisa, the forcible recruitment of lumads into paramilitary group Alamara, and the usurpation of authority by Alamara leaders from the tribal leaders of Talaingod and Kapalong, Davao del Norte, and San Fernando, Bukidnon, are among the many cases that they will raise. Attacks and militarization against IP learning schools were also discussed. Rius Valle of Save Our Schools Network presented pictures and video of actual school encampment of the military in various places. Ronie Garcia, Administrator of STTICLC presented the strafing incidents last October 14-17 that transpired in their school in Talaingod, Davao Del Norte where the military are encamping the community. Garcia and the students survived the strafing. He also said that the Local Government Unit in the is futile that they did not receive any help even after various dialogues with the officials. Hanimay Suazo of Karapatan is hopeful in the inquiry that it would do well to shed light on the human rights violations. Suazo said that the human rights violations should be factored in by the congress when it decides for the budget of the military. She said that aside from pork barrel funds, the lion’s share of the military of the national budget should be condemned as well. She claimed that the modernization program of the AFP will not bolster the state’s armed forces, as long as its long record of human rights violations are not resolved. The lawmakers who attended the said Congressional Inquiry were as follows: Cong. Guillermo Romarate, Cong. Antonio Tinio, Congw. Luz Ilagan, Cong. Karlos Zarate and Cong. Fernando Hicap. We are reposting the Press Release of PASAKA-SMR on the misrepresentation by the Eastern Mindnao Command of UN Special Rapporteur on Internally Displaced Persons Chaloka Beyani. DAVAO CITY – PASAKA-SMR decried today the efforts of the military to misinform the public by maliciously twisting the stand of the United Nations Special Rapporteur on Internally Displaced Persons (IDP’s) on the evacuees in UCCP Haran. The military propagated in the media thru their Press Release quoting UN Rapporteur, Dr. Chaloka Beyani saying that the lumad evacuees are “manipulated”. Graham Fox, Dr. Chaloka Beyani’s media officer clarified to Interaksyon editor, Nonoy Espina, that he “does not recognize the quote attributed to Mr. Beyani by the AFP”. “The government has insulted Dr. Beyani, and the entire mission of pursuing peace. The military’s insincerity towards giving protection to the nation is clearly reflected here,” he added. “This conjures in mind psychotic individuals who are unable to realize concrete situations and see the human rights dimension in these. And we cannot have liars like them overseeing the daily operations of thousands of individuals armed with deadly weapons,” Fanagel said. 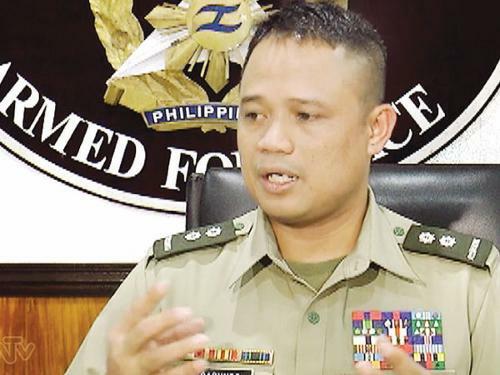 DAVAO CITY- Karapatan-SMR expressed its fears regarding the recent news of Col. Harold Cabunoc’s reassignment to IP-military projects in Davao, saying that such action will only intensify the war of the AFP against lumad communities. 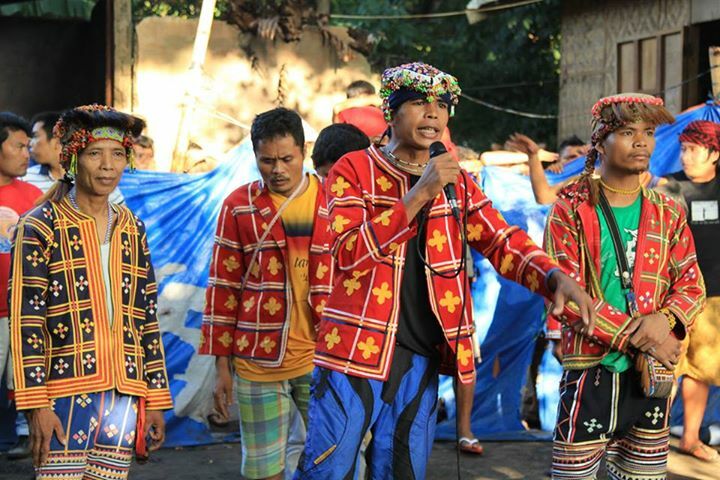 Hanimay Suazo, secretary-general of Karapatan-SMR, said that Cabunoc’s “anti-social attitude and narrow-minded opinion” endangers “the already maligned and marginalized lumads, who’ve already had more than enough of the AFP in the recent months”. 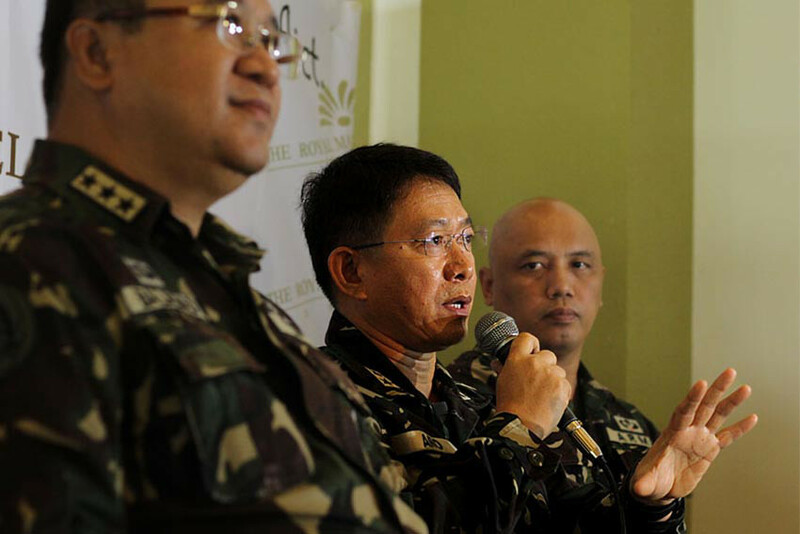 “Cabunoc’s actions as chief of the AFP PAO already showed his gung-ho nature and verbal trigger-happy tendencies. It was him who tainted further the image of the AFP when he publicly aired his misinformed opinions on state issues, earning the ire of simple citizens and media personalities,” Suazo added. It can be remembered that Cabunoc had a twitter war with veteran journalist Cheche Lazaro regarding the actions of the foreign partner of slain transgender Jennifer Laude. Recently, Cabunoc had another skirmish with a journalist in twitter, this time about the plight of the 700 lumad evacuees housed in UCCP Haran. 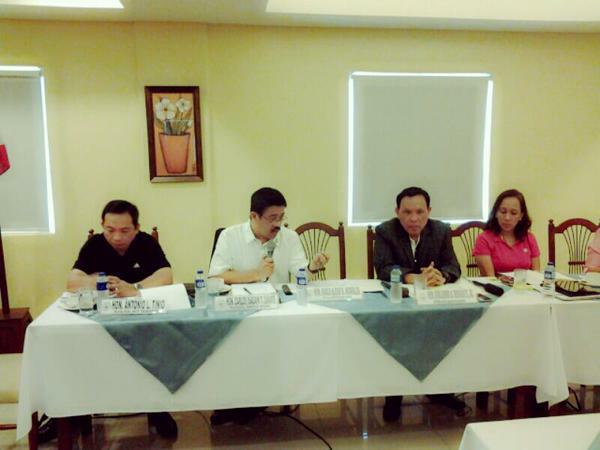 Suazo deplored Cabunoc’s reasoning regarding the situation of the evacuees. “Cabunoc’s statements regarding social issues are irresponsible, if not inappropriate and lacking concrete analysis,” Suazo added. Suazo claims that Cabunoc’s “irresponsible handling of his job when he was in the PAO” posed great dangers, one that human rights groups should be wary of. “The ignorance of a man in public office is more dangerous than the barrel of a gun in the forests. That much we should acknowledge,” Suazo said. PUPPET MASTERS Lumads from Talaingod were coerced into protesting for the military at Naval Station Felix Apolinario in Panacan, Davao City, last June 12. Out of fear, they willingly complied to the orders of the military. (Photo by Ace Morandante of Davao Today, Caption by Samuel dela Cruz). DAVAO CITY- Some lumads from militarized Sitio Laslasakan, Talaingod, Davao del Norte reported that they have been coerced by the military to join protests in Tagum and Davao City. According to Niño (Not his real name), he and his companions in Sitio Laslasakan were harassed by the military, then coerced to falsely admit that they were NPA. “Nahadlok na jud mi ato, mao napugos na lang mi ug tug-an, maski dili tinuod, na NPA mi,” (We were really afraid, so we were forced to admit, even when it was not true, that we were NPA’s”) Niño said. Days later, Nino was brought to JBL in Talaingod, where they were presented as rebel returnees to the public. A sack of rice was promised to them after their participation in the said conference, which lasted for three days. On June 12, they boarded trucks and were sent to the Radyo ni Juan station in Tagum City, where they were told to rally gainst the said station. “Gi-ingnan mi sa sundalo ‘Shagit mo na tarungon sa RnJ (Radyo ni Juan) ang ilang pagbalita, dili na tirahon ang mga military’” (“We were told by the soldiers ‘Shout out to RnJ that they should do right their reportage, to not anymore make bad remarks about the military’”), Niño said. They boarded the trucks once more, and were brought to Camp Panacan in Davao City. “Pag-abot sa Davao, gipa-rally na pud mi didto sa Panacan. Ingon ang sundalo manawagan daw na ibalik ang PDAF, nya pahawoon ang mga eskwelahan sa Salugpungan, ug ipabilin ang military sa Talaingod (“Upon arrival in Davao, we were made to protest once more in Panacan. The soldiers said that we should call for the return of PDAF, for the removal of the Salugpungan schools, and for the military to remain in Talaingod”), Nino said. Asked whether he knew what PDAF meant, Niño said “wala ko kabalo unsa jud na. Unsa diay na?” (“I do not know what that is. What is that?”). 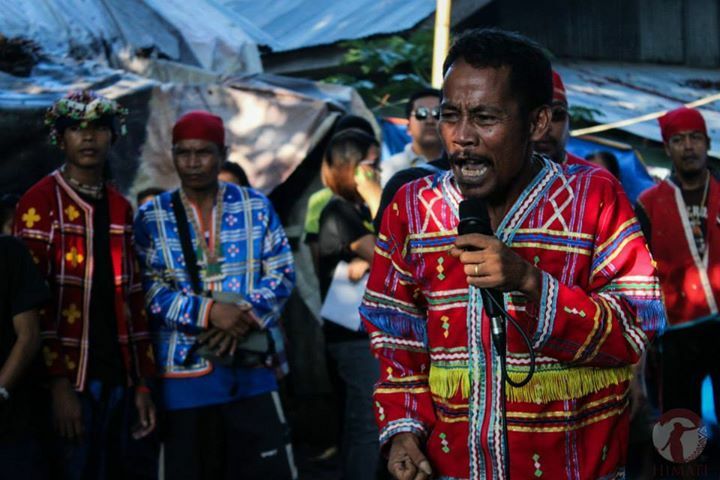 Hanimay Suazo, secretary-general of Karapatan-SMR, said that the case of Nino and several others are again another glaring example of the military’s tactic of pitting the lumads against each other. “With Niño’s story, it is clear that it is the military who is manipulating the lumads, capitalizing on their fear of them and their poverty,” Suazo concluded. DAVAO CITY- Hanimay Suazo, secretary-general of Karapatan-SMR, said that state forces are the only ones interested in sending the text threats to the leaders of lumad evacuees in UCCP Haran. Suazo adds that the military and their political cohorts are desperate to break the will of the lumad evacuees, after their “rescue” miserably failed. “The July 23 incident clearly showed that violence is not the answer to the problem of the lumads. But these state forces only add fuel to the fire, with the messages they are sending,” Suazo said. Suazo said that with these threats, the reason for the lumads to take shelter in Davao City has only strengthened. DAVAO CITY- Leaders of lumad evacuees sheltered in UCCP Haran decried “death threats” from unknown individuals since the botched rescue of police elements and government agencies last July 23. The threats, sent through text messages, accuse the evacuees of being “supporters of the NPA”, and urging them to “stop being used as pawns” by the said group. Some messages even challenge the evacuees to a one-on-one fight with the anonymous people sending the messages. Benito Bay-ao, of the Salugpungan Ta Tanu Igkanugon (Unity in Defense of the Ancestral Land), is the latest victim of this “text threats”. “It further said that if ‘they’ enter here (UCCP Haran), we won’t just be beaten up. We would be killed,” Bay-ao said. Palo (not his real name), a youth leader from Kapalong, said that he had received text threats only two days after the incident in July 23. Palo too, was told that they would be killed. Palo became prominent after the failed rescue, as he was photographed while in the frontlines of those who formed a human barricade to deter the entry of the police. 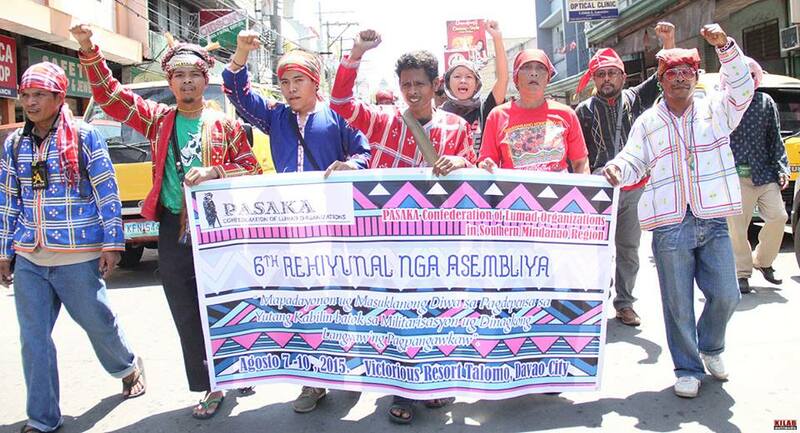 But the lumad leaders remain undaunted in their stand. “We are not afraid. Why would we be afraid? We have done nothing wrong,” Bay-ao said. “They can kill us all they want, but what will they gain? Anyway, it would be better for us to die than to cower in fear, or to join the Alamara,” Bay-ao said. 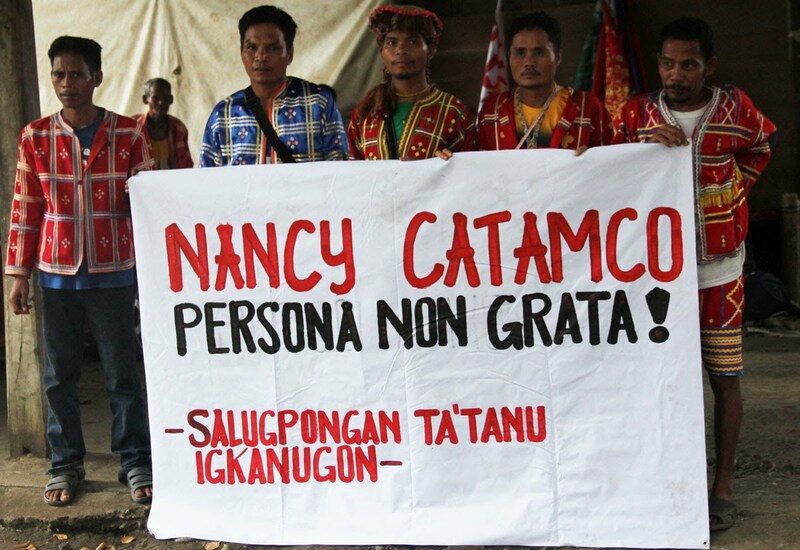 We are reposting the declaration of “Persona Non Grata” status to Nancy Catamco by the 700 Manobo evacuees led by the lumad leaders of the Salugpungan Ta Tanu Igkanugon (Unity in Defense of the Ancestral Land). 6) Surrender of her lumad status by her clear collaboration with state elements who threaten the lives and cultures of lumads. Many times in the past we have taken part in dialogues mediated by Mayor Rodrigo Duterte, and many times we have been treated with respect and understanding, our side heard and articulated fairly by Mayor himself. Such are the kind of dialogues that we will willingly enter, not the ones where Nancy Catamco presides and steps on our human rights and dignities. Here we also reaffirm that we are the true leaders of the people in Talaingod, not the IPMR leaders under the NCIP, which have become the current puppies of the reactionary government of the US-Aquino regime.